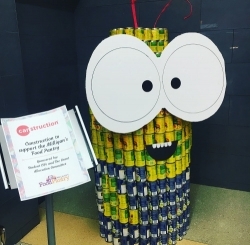 In addition, to increasing awareness about food waste, students were able to participate in Canstruction—the building of the American flag and a Minion character—using food purchased with funding from the Grant Allocation Committee (to be donated to Milligan’s Food Pantry). In addition, students took advantage of multiple viewings of the documentary A Place at the Table screened during lunch and dinner services from April 27 to May 1. 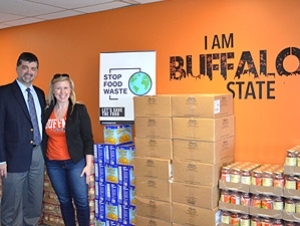 Glenn Bucello, resident district manager, and Kristen Helling, assistant director of Student Life (both pictured at top), also worked with Buffalo State's Stripes Media to create a radio segment about food waste. A week of events concluded with students donating unused meal swipes back to Chartwells in exchange for a donation to Milligan’s Food Pantry. Over 200 meal swipes were donated yielding 252 jars of pasta sauce, 256 lbs. of penne pasta, 252 boxes of macaroni and cheese, 252 jars of peanut butter and 1,248 packages of ramen noodles. 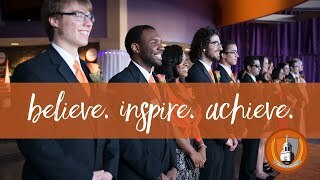 The partnership between Student Life and Chartwells exposed over 2,000 students per day to our food-insecurity awareness initiatives and sharply increase donations to Milligan’s Food Pantry.